Our historical church, "The Annunciation of Our Lady", reopened its doors for first time on 24 March - on the eve of the Fest-Day of the Annunciation. Many people attended the Feast-Day celebrations and the church will also be open for Easter. The church suffered severe damage early May 2016 by fire. The first stage of the reinstatement project was recently completed but the next stages will occur in gradual steps. The church was severely damaged by fire on the 2nd May 2016 and since then an extensive reinstatement project has been undertaken by our organisation. With the completion of phase 1 of the reinstatement project, the Church will now be open again for services as per normal. The areas destroyed by the fire have been extensively structurally reinstated and the church is now available for the commencement of services. The Board would like to point out that works will continue to complete phase 2 of the project, which will include the reinstatement of the hagiography the fittings and the fixtures. The celebratory activities for the Holy Feast Day continued on the 25th March, Holy Feast Day of the Church with His Grace Bishop Iakovos presiding assisted by a number of Orthodox Priest. Hundreds of parishioners attended the celebratory activities of the Church. 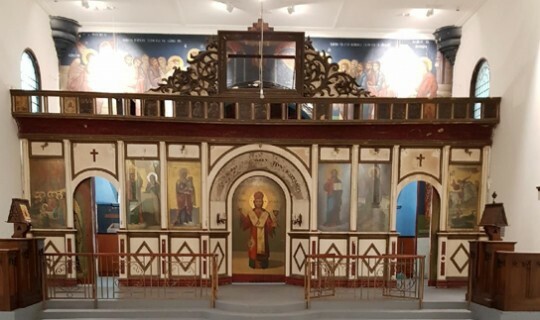 “The Evangelismos reinstatement project has reaffirmed the community’s commitment to its religious, historical and national heritage,” said Associated Professor and GCM Treasurer Marinis Pirpiris.